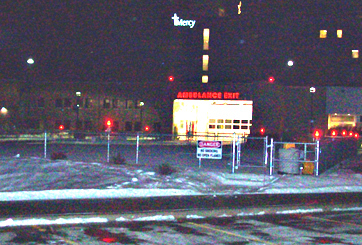 Helipad at Mercy-Medical Center North Iowa. A medical helicopter that was flying from Mason City to Emmetsburg to pick up a patient crashed in north-central Iowa last night, killing all three people on board. The helicopter used by Mercy Medical Center-North Iowa in Mason City as part of the Med-Trans helicopter service crashed just north of Ventura at about 9 o’clock Wednesday night. Two of the three killed were hospital employees, nurse Shelly Lair-Langenbau and paramedic Russell Piehl. The third person was a Med-Trans pilot whose name has not been released. Mercy-North Iowa president Dan Varnum says the entire organization is devastated and the victims’ colleagues in healthcare are grieving the loss. The cause of the accident is unknown. The FAA and local law enforcement officials continue to investigate the accident.